Dress for airport security checkpoints? ....Why? Most people don't give much thought about what they wear to the airport. When you're packing and choosing your clothes, it pays to think about security at the airport as well as what you'll be doing on your trip. You need to decide if you're going to carry everything on or if you'll be checking luggage. And how you pack can make a difference when you are trying to go through security lines at the airport. So think about how you're going to dress for those airport security checkpoints and well as for the flight. How can what you're wearing create hassles? Anything you have on that is metal is apt to set off alarms. Leave the heavy jewelry home or pack it in your carry-on bag. Are you into body piercing? You may want to remove those for the flight. Even hair barrettes and clothing with big metal buttons can set off metal detectors that are very sensitive. You'll get through security with any of these things eventually, but you'll get through faster if you're not wearing them. Remember, in the U.S. you'll have to take off your shoes unless you have TSA Pre-Check. Slip on shoes are easiest. Tennis shoes or lace up shoes take a little longer to get off and back on. And unless you really, really want to wear those hard-to-get-on-and-off cowboy boots... you might just want to pack them or leave them home. Bulky sweaters and jackets have to be removed for security. You'll just have to put up with that... you don't want to pack them, especially if you're not checking luggage. Room in those carry-on bags is always at a premium! I have to tell you, we've been through those new body scanners a few times now at airport security checkpoints... They had us take off our money belts... and those aren't even metal! I'm not going to stop wearing one of those though... those money belts are for travel security of a whole different sort... the security of my travel documents! If you will be traveling with carry-on only, then you need to prepare your one quart/one liter-sized, clear plastic zip-top bag. You don't want to be throwing out liquids at the checkpoint or trying to cram some 3 ounce/100ml bottles into a plastic bag at the last minute. All of your carry-on liquids, gels and creams must go into one bag, and they must all be 3 ounces/100ml or less. If you will be checking luggage, you can put any amount of liquids into those bags. You are not limited to the 3 ounces or 100ml, but can carry as much as you want. Try to pack your carry-on bag in an orderly fashion. And that may cause you to be delayed at screening or even be pulled aside for an extra bag search. If you're planning to take a laptop computer or other large electronics, it's safer to pack them in your carry-on bag. You'll have to take these large electronic items out of your bag for screening. (The exception here is if you have one of the newly approved laptop bags that allows the computer to be screened without removing it. Or if you are approved for TSA PreCheck. Check with airline or government websites for more information). If you're carrying gifts, don't wrap them until you get to your destination in case they need extra screening. You might just have to unwrap them at the airport security checkpoints, and you don't want to have to wrap them twice. Get to the airport early enough so you won't be rushed. Have your boarding pass and identification available for the officers. Know what airline cut-off times are for check in. 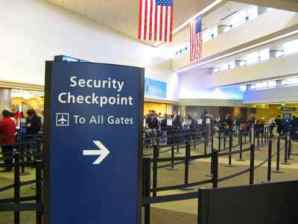 You must generally check in earlier for international flights than you do for domestic flights. And remember it can take a while to get through those airport security checkpoints even if you've packed and dressed for it.